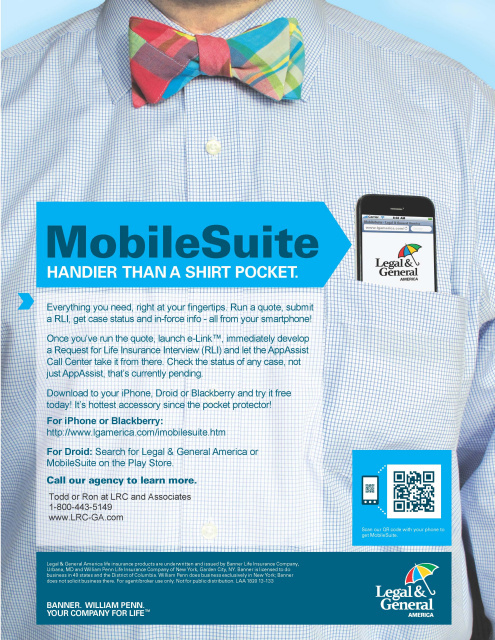 Mobile Suite Plus AppAssist = 2 very powerful tools to help you write more business while doing less work. We have taken the concept of mobile convenience even further with MobileSuite, our latest app that not only runs quotes on the go but also allows you to submit business through AppAssist and check case status in one app. Once you’ve run the quote, you can launch e-Link, immediately develop a Request for Life Insurance Interview (RLI) and let the AppAssist Call Center take it from there. Once your application is in process, you can check status on your phone and get in-force status - it’s just a tap away! The quote section of the app is open for all users; if e-Link is selected after the quote, a user name and password are required. • MobileQuote – The same mobile quoting system that you have come to know and use to quote term and UL from anywhere and anytime can be found in MobileSuite. 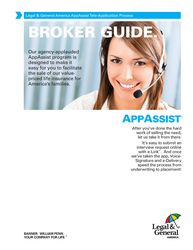 • AppAssist e-Link – Submit a Request for Life Insurance Interview through your mobile device. We’ll complete the application. • Pending Case Status – You can now check new business case status in a phone-friendly format. Use the same agent number and password that you would use when logging into www.LGAmerica.com. Once you have logged in, you may search by policy number or insured’s last name to obtain new business status in real time. Want to Test Drive App Assist to see how it works? Fill out the following Information and we will get you more information. We will get you up and running ASAP.